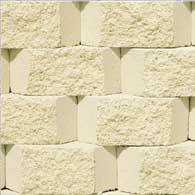 Bricks fire-resistant shamotny and semi-sour. Gardenwall retaining wall is ideal in those designs which use contours and curves and is suitable for walls under 800mm high. A range of four colours are available to complement any garden style with the natural look of quarried stone. Gardenwall retaining wall is suitable for DIY installation and are quick and easy to construct without the use of mortar joints or concrete footing. The retaining wall units are designed with an interlocking lip that creates a strong bond along the entire wall.